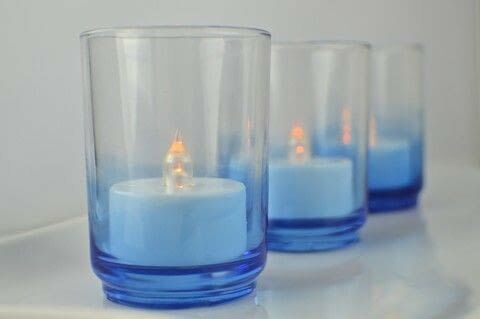 Make these dip dyed glass candleholders to add a little ambiance! Follow this tutorial to decorate your home with classy glass candleholders dipped in colorful glass stain. Gather your supplies. There are different methods you can use to dry the dipped glasses, but I recommend hanging them. 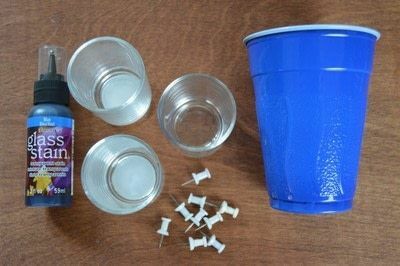 You can also set them on thumbtacks to dry but will risk messing up the paint on the bottom. 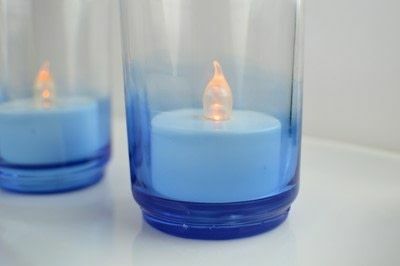 Fill a cup with glass paint and, holding the glass candleholder around the rim, dip it into the paint until the bottom half or so is covered and hold. After about 30 seconds, pull it out, let the excess paint drip off, and use clips around the rim to hold up the glass. Use toothpicks to move or pop any bubbles in the paint. String wooden dowels or pencils through the clips to hold them up, balancing on a glass. Alternatively, you can hold them up on push pins if you prefer, but it may risk ruining the paint on the bottom. Let dry overnight and display with a tea light inside!